How Much Does Air Conditioner Replacement Cost? If the duct of your air conditioner is making a lot of noise or you are experiencing stale air, then you should pay attention to it. This could probably mean that your existing air conditioner is not functioning properly and may require repair or even replacement. Sometimes it is wiser to go for home ac replacement instead of repair. This is because after a certain point the air conditioners do not perform well even after repair. So, your money gets wasted in repair. At the same time, old and beat air conditioners consume a lot of power. Therefore, you will lose a lot of money over time. The new air conditioners may cost you some money. But the modern air conditioners are designed to be very energy efficient. This means that you may need to put money up front for the purchase but over a period of time it will only save you money. So, how much does the air conditioner cost? The cost of the air conditioner replacement depends upon several factors. Primarily, the type of AC you buy decides the price. Here are some of the major factors. 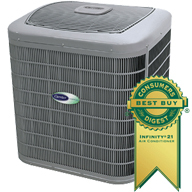 It is one of the most important factors that determine the cost of an air conditioner. The power capacity of the air conditioners is measured in tons or kilowatts. For laypeople, ‘ton’ is the more familiar word. The residential air conditioners are available from 1 ton to 5 tons. In kilowatts it is the range from 3KW to 20KW. The larger the power capacity, the more expensive will be the air conditioner. The choice of power capacity while buying an AC is dependent upon the size of a room and insulation. For instance, if there is a very small room then a 1 ton AC would be enough. However, for large sized rooms you may need more power capacity. If the room is too big then you may need multiple ACs. Energy efficiency is another factor that determines the cost of the AC. SEER (seasonal energy efficiency ratio) rates the energy efficiency of an air conditioner. We will not get into any further technical details. What we need to know is that higher the rating of the AC, the costlier it will be. Investing in a high quality air conditioner with higher energy rating is a good move. This is because initially it will cost more but over time it will save you a lot of money. The price of the AC is also dependent upon the brand. The more popular and trusted brands cost more. Besides the cost of the AC itself, you will also want to include the cost of labor and spare ac replacement parts during replacement. Installation charges are often significant and they may be a deciding factor for many. This entry was posted in Air Conditioning Services and tagged ac replacment, air conditioner repair dallas by Whit Kinser. Bookmark the permalink.